Recent evidence indicates the presence of bidirectional interactions between the hypothalamic-pituitary-thyroid (HPT) axis and the immune system. Hypothyroidism leads to a suppression of humoral and cell-mediated immune responses, effects that are often reversed by restoration of the euthyroid state. In accordance, chronic stress induces a decrease in thyroid hormone levels that in turn, lead to impaired humoral and T-cell mediated responses. Despite the existence of contradictory results, in general, hyperthyroidism has been shown to up-regulate immunity. Circulating thyroid hormone levels seem to be related to the immune function in subjects with altered thyroid status. Here, we discuss the participation of these interactions in immune homeostasis, as well as in the development and course of autoimmune thyroid diseases. For many years the immune system has been considered to be autoregulated to avoid the perpetuation of protective responses once the pathogen has been eliminated and to prevent harmful autoimmune responses. Thus, the control of self-reactive T cells takes place in the thymus during ontogeny and in the periphery after birth, while regulatory mechanisms against effector cell responses to foreign antigens act in the peripheral lymphoid organs throughout life. Many immune cells participate in immune responses, but control mechanisms are mainly exerted through T helper (Th) lymphocytes. Th cells are able to recruit and activate other immune cells including B lymphocytes, cytotoxic T cells, macrophages, mast cells, neutrophils, eosinophils and basophils. Naïve CD4 T cells are categorized according to their functions, their pattern of cytokine secretion and their expression of specific transcription factors. Although other Th lineages may exist, there are four major lineages, Th1, Th2, Th17 and T regulatory (Treg) cells. The differentiation of Th cells usually depends on a unique combination of stimulants and on the subsequent activation of diverse transcription factors . With the discovery of the Th1/Th2 paradigm, most phenomena related to adaptive immunity had been explained. Th1 cells direct cell-mediated immune responses that control intracellular infections, whereas Th2 cells essentially eliminate extracellular antigens, supporting humoral immunity and being involved in allergic reactions. The cross-regulation between both cell types is managed by the secretion of different cytokines released by each T cell subtype that can inhibit the function of the other subset [2, 3]. Recently, other Th cells have come onto the scene, with Th17 cells facilitating various aspects of immune activation including inflammation, and being recognized as the central effectors in organ-related autoimmune diseases . Treg cells, on the other hand, are in charge of suppressing potentially deleterious activities of the other Th cells. Interestingly, it has been indicated that a dichotomy exists in the generation of Th17 and Treg cells, depending on whether they are activated in the presence of TGF-beta or TGF-beta plus inflammatory cytokines such as IL-6 , which takes part in the control of inflammatory and autoimmune diseases. Besides the autoregulatory mechanisms mentioned above, the immune system is also controlled by the neuroendocrine system. A bidirectional network exists between both systems in which hormones and neurotransmitters are able to affect immune function and, thereby also affecting immune mediators that are then capable of inducing neuroendocrine changes. This two-way communication is possible as both systems share receptors for common ligands and their coupled signaling pathways. The back and forth information, which flows between the neuroendocrine and the immune systems, functions to maintain and protect the internal homeostasis of the organism [5, 6]. In this network, hormones and neuropeptides provide the link between the neuroendocrine and the immune systems constituting specific axes. Amongst these are two well studied axes, the hypothalamic-pituitary-adrenal (HPA) axis and the hypothalamic-pituitary-thyroid (HPT) axis. Furthermore, the autonomic nervous system, through the innervation of lymphoid organs, also communicates with the lymphoid compartment by releasing neurotransmitters able to regulate immune cell physiology . Thus, it appears that multidirectional communication networks exist within the body that permit the signal transmission between these various systems to keep homeostasis during times of stress, injury, disease or other pathological conditions. Of note, the participation of HPT axis hormones in immune system regulation has received comparatively less attention than the effects exerted by hormones of the HPA axis. This is perhaps related to the dominating role of autoimmunity in the pathogenesis of thyroid disorders that makes it difficult to explore the role of the HPT axis hormones in the physiologic control of immunity. In this overview we discuss the immunomodulatory effects of thyroid hormones, as well as their participation in immune dysfunction during stress conditions. The role of thyroid hormones under physiological conditions and their potential contribution to the progress of autoimmune thyroid diseases are briefly outlined as well. How Do Thyroid Hormones Regulate Immunity? Thyroid hormones play critical roles in differentiation, growth and metabolism . Their release from the thyroid gland involves a fine tuned regulated mechanism that includes structures of the central nervous system. Low circulating levels of thyroid hormones are sensed in the hypothalamus, which responds by releasing thyrotropin releasing hormone (TRH). The TRH stimulates the pituitary to produce thyrotropin or thyroid stimulating hormone (TSH), which, in turn, stimulates the thyroid gland to produce thyroid hormone until levels in the blood return to normal. These hormones are then transported by the blood to many different target tissues where they regulate the transcription of genes controlling cell metabolism. This system is down-regulated by thyroid hormones (T3 and T4), which provide a negative feed back control on both the hypothalamus and the pituitary gland, thus controlling the release of TRH and TSH, respectively . With respect to their relation with the immune system, thyroid hormone participation in primary and secondary lymphopoiesis has been described [9, 10]. However, some evidence raised from analysis of lymphocyte development and function in mice with genetic defects in the expression of thyroid hormones or their receptors, suggested that these hormones are not necessarily required for the development of a normal immune response. In fact, no alteration in humoral or cell-mediated immunity was found in dwarf mice with genetic defects in genes encoding for several anabolic hormones (including thyroid hormones) or in thyroid hormone deficient hyt/hyt knockout . The authors hypothesized that thyroid hormones are involved in immune system homeostasis maintenance in response to environmental changes or stress-mediated immunosuppression [11, 12]. Although knockout mice studies have demonstrated that hormone deficiency is not incompatible with life, many of the effects on peripheral tissues were milder in these animals than those seen in congenital hypothyroidism . On the other hand, the presence of functional receptors for HPT hormones on lymphocytes as well as the frequent immune alterations observed during physiological or pathological fluctuations of thyroid hormones strengthens the interactions between the HPT axis hormones and the immune system . The presence of triiodothyronine (T3) in lymphocytes, mast cells, monocytes, macrophage and granulocytes from rat peritoneal fluid and blood, and in thymic lymphocytes was demonstrated as well . This extrathyroidal source of T3 is regulated by TSH and is needed for maintaining cell proliferation and the normal status in the immune system [13, 14]. Thus, in order to analyze the role that thyroid hormones exert on immunity in individuals with different thyroid status, but without autoimmune pathology, it is important to clarify the effect of thyroid axis on immune function. Hypothyroidism in humans, as well as experimental hypothyroidism induced by antithyroid agents or by thyroidectomy in rodents, has been linked to diminished thymic activity, spleen and lymph node involution and suppressed humoral and cell-mediated immune responses [14 – 17]. Immune deleterious consequences of hypothyroidism include increased severity of respiratory syncytial virus infection  that may contribute to a poor outcome in patients with viral, septic or critical illness [19 – 21]. Moreover, in children with congenital hypothyroidism a severe deficiency of IgA and IgM serum levels was recently described. In these patients, a significant correlation was observed between serum IgA and IgM concentrations, and free thyroxine (T4) levels, and with the severity of congenital hypothyroidism, as well . Many of the immune consequences of hypothyroidism can be reversed by treatment with thyroid hormones [14, 15]. Thus, restoration of thyroid function, after thiourea-induced blockade, recomposed the humoral response to sheep red blood cells (SRBCs) in birds  and similar results were obtained after T3 administration in propylthiouracil-induced hypothyroid mice for both humoral and cell-mediated immune responses [24, 25]. The fact that T3 is able to revert the effects of the thyrostatic drug on the immune response implies that the immunomodulatory actions are not related to a direct effect of the anti-thyroid agent, but to the levels of the thyroid hormone itself. In addition, the suppression of cell-mediated immunity in severe human hypothyroidism was accompanied by an improvement of lymphocyte function with the gradual return to a euthyroid condition . On the other hand, contradictory results exist in the literature on the effects of experimental hyperthyroidism on immunity. In fact, it was shown that hyperthyroid condition can lead to either suppressing  or enhancing [24, 28, 29] effects on primary antibody responses or on T and B lymphocyte proliferation [16, 24, 25]. These controversial results might have been due to the different species used or to the diverse hormonal treatment established (dose, duration, type of hormone). Thus, chronic treatment with thyroxine (T4), the hormone usually used in replacement therapies for hypothyroid conditions, can lead to an increment in specific antibody responses or in Th1/pro-inflammatory cytokine levels in mice [25, 28]. On the contrary, treatment with higher doses of T4 for few (3 to 7) days induced both a decreased expression of T-cell type cytokines, both at the mRNA and the protein levels, and an impaired lymphocyte response to mitogen stimulation . In addition, most studies in experimental models have not evaluated the status of the HPT axis because thyrotropic hormone activity is difficult to evaluate in rodents. An integrative study of the HTP axis function and the immune status was recently performed in mice, showing that T and B-cell mitogen-induced proliferation of lymphocytes from hyperthyroid mice was higher than that of euthyroid animal cells . This effect was related to an increase in the activation of intracellular signals and in the release of cytokines involved in T lymphocyte activation, such as IL-2 and IFN-γ and of the pro-inflammatory cytokines IL-6 and TNF-α, after an inflammatory stimulus . Moreover, these effects seem not to be due to altered TSH or TRH hormone levels, as the low levels of TSH or TRH that accompany the hyperthyroid condition would lead to a decrease in immune function, as was previously shown for these hormones . In support of this, direct actions of thyroid hormones were demonstrated on immune cells when the addition to T lymphocytes led to stimulation of cell proliferation  or of dendritic cell maturation and function . The preponderance of evidence indicates an enhancing role of thyroid hormones on immune function. In conclusion, one could generalize that low levels of thyroid hormones in vivo lead to a decrease of the immune function, while the opposite occurs when circulating levels of these hormones are high. Despite the proven direct action of thyroid hormones on immune cells, the possible involvement of other endocrine factors regulated by thyroid status cannot be ruled out. An important example of the regulation of immunity exerted by low serum levels of thyroid hormones is found during the course of chronic stress conditions. This issue is briefly discussed below. Stress is defined as any situation capable of perturbing the physiological or psychological homeostasis. Exposure to adverse situations affects many aspects of our daily life. While response to stress is a necessary survival mechanism, prolonged stress can have several repercussions affecting behavioral, endocrine and immunological parameters . The recognition of these effects has led McEwen  to develop a new terminology to link the protective and damaging biologic response to stressors, namely, allostasis and allostatic overload. Allostasis refers to the adaptive processes that maintain homeostasis through the production of neuroendocrine mediators and cytokines. These mediators of the stress response promote adaptation in the aftermath of acute stress, but they also contribute to allostatic overload, the wear and tear on the body and brain that result from being “stressed out” . In fact, chronic stress is considered a key factor in the development of several pathologies, including psychiatric diseases, disruption of neuroendocrine systems, alterations of the immune response and even cancer . This is evidenced by a reduction of T cytotoxic and natural killer (NK) activities , by a decrease in T-lymphocyte proliferative response to mitogens through a reduction of the intracellular signals involved in T cell activation , impairment of antibody production  and changes in cytokine secretion . There are a variety of potential mechanisms by which stressors can alter immune function. One of these mechanisms includes alterations of the endocrine system that in turn modulate the immune function . The investigations have traditionally focused on the activation of the HPA axis and the sympathetic adrenal medullary system . In this respect less attention has been given to the role of the HPT axis, although there is strong evidence of an important relationship between stress and thyroid function . Differences in adaptative responses to stress would be related to either activation or suppression of the thyroid system. Thus, traumatic stress is accompanied by activation of thyroid function, and patients with hyperthyroidism report more stressful life events than members of a control population [43, 44]. Conversely, in chronic posttraumatic stress disorder patients, significantly lower plasma cortisol and TSH levels are reported with respect to control subjects . In addition, chronic stress has been generally associated with suppression of thyroid axis function . A reduction in serum levels of thyroid hormones, mainly of the biologically active T3, was found in stressed animals that correlated with lower titers of specific antibodies after alloimmunization  and reduced lymphocyte reactivity in response to mitogens . Thyroidal inhibition after exposure to diverse stressors was also described in other species . A very important finding was that restoration of physiologic thyroid hormone levels by T4 treatment in stressed animals not only restored thyroid hormone serum levels, but also reverted stress-mediated effects on immunity, thus suggesting that chronic stress induces an alteration of thyroid axis function that in turn alters the immune response . During stress, suppressed secretion of TSH and decreased conversion of T4 to the potent biologically active T3 in peripheral tissues have been described , so a major decrease in T3 levels could be responsible for the alterations in the immune response. Nevertheless, the possible participation of other endocrine mediators can not be ruled out. In fact, it has been described that both T3 and T4 may influence the levels of plasma and adrenal corticosterone [50, 51] and it is well known the modulatory action of glucocorticoids on the immune function . These findings of endocrine system modulation on the immune system, during stress, could participate in the etiology of many diseases, including cancer. Despite that in humans the role of stress as a risk factor for cancer development has not been conclusively established, several epidemiological and clinical studies have linked psychological factors such as stress, chronic depression, and lack of social support to the incidence and progression of cancer . The increment of tumor development and progression mediated by stress was demonstrated in several types of cancer animal models. Although the mechanisms underlying this relation are not completely understood, recent studies have begun to unravel some of the immune components, modulated by neuroendocrine effects that may affect tumor growth and metastasis . Several findings indicate that different types of stressful conditions result in the promotion of distinct murine tumors, namely ovarian carcinoma , B16F10 melanoma  and Ehrlich tumor  among others. In addition, Freire-Garabal et al. found that chronic auditory stress results in a modification of the incidence of breast cancer in mice and development of lung metastases in rats. Frick et al. demonstrated in a syngeneic murine lymphoma model that the T-cell response, but not the activity of NK cells, is negatively affected in chronic restrained stressed mice that additionally display an enhancement of tumor growth (i.e. increased tumor size and proliferation and reduced animal survival). Regarding the T-lymphocyte subset distribution, these authors  demonstrated that chronic stress resulted in a reduction of CD4+, but not CD8+ or T-lymphocytes in the lymph nodes, indicating that stress mainly affects T-helper immunity, as previously suggested . Although the participation of NK cells in these processes cannot be ruled out, NK activity has classically been related to the inhibition of metastasis  rather than to the control of tumor cell proliferation which is mainly mediated by T cells . Additionally, Frick et al. demonstrated that stressed tumor-bearing mice had a reduced specific anti-tumor T cell cytotoxic response and reduced TNF-α and IFN-γ levels, strengthening the evidence that chronic exposure to stress promotes cancer establishment and subsequent progression, probably by depressing T-cell mediated immunity. Recently, the participation of the HPA and HPT neuroendocrine axes as well as the autonomic nervous system (ANS) were studied in an experimental tumor model using a murine lymphoma as possible mediators of stress-induced immunosupression . Classic stress-related hormones, i.e. glucocorticoids and catecholamines, were increased by a single session of restraint stress, but during chronic exposure to the stressor their levels returned to basal values, as previously demonstrated for the chronic mild stress model . In contrast, thyroid hormones were down regulated only after chronic restraint stress , as it was shown in other animal models of stress [47, 63, 64]. This decrease in thyroid hormone levels that is accompanied by impairment in T-cell reactivity was also observed in chronically stressed mice bearing solid tumors . At the molecular level, it was also reported that chronic stress reduces the activation of specific protein kinase C (PKC), isoforms known to be involved in T-cell activation, namely PKC θ and α isoenzymes . Moreover, T4 replacement in these animals, which restored the euthyroid status, not only reversed the effect on T lymphocyte function and signaling events, but also prevented the exacerbation of tumor growth and the inhibition of the specific cytotoxic response against lymphoma cells . The relevance of thyroid hormone participation in the effects of stress on the described lymphoma model is strengthened by the fact that in the particular case of leukemias/lymphomas, both glucocorticoids and cathecolamines often induce apoptosis in tumor cells rather than proliferation [65, 66]. In fact, Frick et al. , using in vitro assays, demonstrated that dexamethasone and epinephrine blocked lymphoma cell proliferation. Although no direct action of thyroid hormones was found on this lymphoma cell, direct stimulation of proliferation was described to be induced by both T3 and T4 in another T lymphoma cell line . These findings point to the relevance of HPT deregulation as a consequence of stress and also point out the potential therapeutic action of T4 in the adjuvant treatment of stress-related disorders such as immunosuppression and cancer. Analysis of the relationship between thyroid hormones and immune function in humans involve mainly subjects with autoimmune diseases. These studies demonstrate that altered thyroid hormone concentration is associated with altered immunity, but whether these observations are directly due to the actions of thyroid hormones or underlying autoimmunity can not be well established. In this sense, the autoimmune condition in hyperthyroid patients is mainly related to antibodies against the TSH receptor that mimic the function of TSH, and has already been shown to alter the immune function of the TSH hormone as well . Results from animal models of hypo- and hyperthyroidism without autoimmune condition, not only show the importance of thyroid hormone circulating levels in immune modulation, but also suggest their participation in autoimmune thyroid diseases (AITD). In fact, these altered levels of thyroid hormones would have an effect in the pathological immune process of AITD. The question that arises is how and to what extent do thyroid hormone levels affect the immune response function in autoimmune thyroid conditions? The possible consequences of altered levels of thyroid hormones in the course of AITD are outlined below. Autoimmune thyroid diseases (AITD), one of the most common organ specific autoimmune disorders, affect approximately 5% of the overall population, mainly women. These disorders result in dysfunction (hyperfunction, hypofunction or both) of the thyroid gland, and the two most common entities have opposing effects i.e. hypothyroidism represented by Hashimoto’s thyroiditis (HT) and hyperthyroidism by the Graves’ disease (GD) . These two disorders share, at least in part, a common genetic background and may occur in the same family, as well as in the same individual, but they are two distinct diseases, both in their clinical presentation and their pathophysiology. Several pieces of evidence suggest that the phenotypic expression of thyroid autoimmunity toward one or the other clinical entity is largely dependent on the pattern of immune response that predominates at a given time . The main thyroid autoantigens in HT and GD are thyroglobulin (Tg), thyroid peroxidase (TPO), the primary enzyme involved in the production of thyroid hormones, and the TSH receptor (TSH-R). Unlike antibodies against Tg, TPO antibodies are capable of inducing antibody-dependent cell-mediated cytotoxicity. On the other hand, antibodies to TSH-R mimic the function of TSH, and cause disease by binding to the TSH-R by stimulating thyroid cells . Pathologically, HT is a typical T-cell-mediated autoimmune disease characterized by the ectopic formation of tertiary lymphoid follicles within the thyroid gland and the destruction of thyroid follicles, by a diffuse or micronodular goiter, the presence of anti-TPO and/or anti-Tg antibodies in serum, and varying degrees of thyroid hypofunction. The intrathyroidal immune cells are B and T lymphocytes, the latter predominating mainly as the CD4+ Th1-subtype. In GD, the infiltration is mild and induces the production of antibodies that bind to the TSH-R stimulating the growth and the function of thyroid follicular cells and consequently leading to hyperthyroidism. The patchy lymphocytic infiltration of the thyroid is mostly made up of T lymphocytes, mainly of CD4+ Th2 cells, although Th1 cells are also found. Therefore, a Th1 pattern of immune response characteristic of cellular immunity is dominant in HT, whereas the predominance of Th2 cytokines in GD indicates a humoral pattern of immune reaction . Not only is the balance in the Th1 vs Th2 pattern of Th cells involved in the development of AITD, but also the participation of Treg and Th17 lymphocytes seems to participate as well. These two subtypes of Th cells, as indicated before, have opposing effects, with Treg cells helping to dampen inflammatory processes and Th17 cells playing a role in the amplification of autoimmune disorders. Thus, it was demonstrated that intrathyroidal Treg cells are decreased in response to apoptosis in patients with AITD, suggesting that this decrease may contribute to the incomplete regulation of autoreactive T cells in AITD , and that naturally existing Treg cells are required for tolerance to experimental autoimmune thyroiditis . A role for Treg in the natural progression of hyperthyroid GD to HT and hypothyroidism in humans has also been suggested . With respect to Th17, an increased differentiation of these lymphocytes and an enhanced synthesis of Th17 cytokines in AITD, mainly in HT, has been described and the possibility that these phenomena have an important role in the pathogenesis of thyroid autoimmunity has been also suggested . Additionally, although the peripheral Th1/Th2 cell ratio has been related to the severity of HD, the proportion of Th17 cells has been related to the intractability of GD . Like most autoimmune diseases, AITD has a multifactor pathogenesis, in which susceptibility genes and environmental factors act in concert to initiate both cellular and humoral immune responses against the thyroid gland . With respect to the genetic background, a Human-Leukocyte-Antigen gene locus was the first AITD susceptibility gene identified, followed by other loci of both class II and class I genes and by other non-HLA genes, including immune-modulating (CTLA-4, CD40 and PTPN22) and thyroid-specific (Tg and TSH-R) genes . All these susceptibility genes participate in the immunological synapse and/or in the signaling pathways activated by the immunological synapse, which provides a potential molecular explanation for the interactions between these susceptibility genes and the AITD pathology. On the other hand, a number of environmental and hormonal factors have an ethiopathogenic role in AITD as the concordance rate for AITD in monozygotic twins is not 100% . Thus, it is postulated that factors such as dietary iodide, selenium deficiency, stress, medications, parity, infection, among others, are related to the development of AITD in genetically predisposed subjects . Among these factors it is important to highlight the role of stress, as was discussed earlier, and that can modulate immunity though the neuroendocrine axis that includes the HPT axis. It is highly likely that the altered levels of thyroid hormones during the course of the AITD are able to influence immune function. Recent evidence indicates that several Th or NK deficiencies in GD or HT patients are restored with a treatment that bring these patients to the euthyroid status [79, 80]. Although the exact causes of these changes are not defined, they seem to be more related to the alterations leading to the autoimmune disorder. However, enhancement or inhibition of immune responses during the course of AITD would by enough to contribute to the pathological process of the illness either aggravating or ameliorating the autoimmune status. Thus, low thyroid hormone levels accompanying HT could ameliorate the autoimmune reaction through the inhibition of the cell-mediated mechanisms or the diminished autoantibody secretion. Alternatively, it would exert a negative control on regulatory lymphocytes, thus worsening clinical status. Conversely, in GD, the increment in the humoral immune response during the hyperthyroid state would increase the levels of anti-TSH-R antibodies affecting the course of the autoimmune disease (see Figure 1). Figure 1. Role of neuroendocrine factors in the establishment and course of autoimmune thyroid diseases (AITD). In genetically predisposed subjects, environmental and neuroendocrine factors, together with altered neuroendocrine-immune interactions contribute to an imbalance in Th1/Th2 and Treg/Th17 responses, resulting in thyroid autoimmune dysfunction. The direction of the response depends mainly on the antigen presenting cells (APC), which are influenced by thyroid autoantigens and the environment of cytokines or neuroendocrine factors being encountered. The result is a shift towards the Th1 response in HT, but to Th2 in GD, and most likely a decreased Treg/Th17 ratio, also contributing to the development of AITD. The course of the thyroid autoimmune disorder is also regulated by thyroid hormone circulating levels, which in turn could aggravate or ameliorate the autoimmune pathology. For example, low levels of thyroid hormones in HT may down regulate the autoimmune reaction but could contribute to a decrease in T reg subsets thereby worsening the clinical status of the patient. In GD, high levels of thyroid hormones may up regulate the humoral responses, which would lead to higher levels of anti-TSH-R antibodies or alternatively may improve Treg function to counteract their action. A bidirectional circuit exists between the neuroendocrine and immune systems that functions to maintain and protect the internal homeostasis of the organism. In this context, interactions between thyroid hormones and the immune system are important to elicit appropriate immune responses, especially when the immune system is challenged as in stressful conditions. Yet when these interactions are altered in genetically predisposed subjects, with the participation of environmental and/or endocrine factors, a situation occurs leading to a Th1/Th2 imbalance that would also be accompanied by an increment in Th17/Treg ratio. These changes could result in thyroid autoimmune dysfunction. The possibility also exists that altered levels of thyroid hormones during the course of the AITD may alter immune function that in turn could influence the evolution of the disease. Both immune alterations leading to AITD, as well as AITD consequences on immunity, complete the picture for finding therapeutic solutions for the management of these endocrine disorders. Further studies on animal models with non autoimmune hypo- and hyperthyroidism would be useful tools to analyze the role that circulating hormone levels exert on immune function. A study in healthy elderly subjects devoid of thyroid illness showed the intricate network of hormones and factors involved in immune response regulation during a healthy euthyroid state . This study demonstrated that thyroid hormone concentrations are positively associated with markers of inflammation, NK-like T cells, expression of IL-6 by activated monocytes, percentage of memory T-lymphocytes, and higher IL-2 receptor density in T-cells . Conversely, thyroid hormone concentration was inversely associated with early lymphocyte apoptosis and the ratio of naïve- to memory T-cytotoxic lymphocytes . Similar findings indicated that thyroid hormones may be involved in the diminished immune responsiveness due to aging, which can be restored by T4 treatment, as described also in aged mice . These findings highlight the relation between altered thyroid function and immunity in healthy older individuals and the importance of these interactions under normal physiological conditions. Financial contributions to the work being reported are grants from the National Research Council (PIP CONICET N° 6054 and 00275) and from the University of Buenos Aires (UBACYT B041 and B039). Zhu J, Paul WE. Heterogeneity and plasticity of T helper cells. Cell Res 2010; 20: 4-12. Romagnani S. Regulation of the T cell response. Clin Exp Allergy 2006; 36: 1357-66. Corthay A. How do regulatory T cells work? Scand J Immunol 2009; 70: 326-36. Basso AS, Cheroutre H, Mucida D. More stories on Th17 cells. Cell Res 2009; 19: 399-411. Blalock JE. The syntax of immune neuroendocrine communication. Immunol Today 1994;15: 504–11. Elenkov IJ. Neurohormonal-cytokine interactions: implications for inflammation, common human diseases and well-being. Neurochem Int 2008, 52: 40-51. Taub DD. Neuroendocrine interactions in the immune system. Cell Immunol 2008; 252: 1-6. Yen PM. Physiological and molecular basis of thyroid hormone action. Physiol Rev 2001; 81: 1097-141. Fabris N, Mocchegiani E, Provinciali M. Pituitary thyroid axis and immune system: a reciprocal neuroendocrine immune interaction. Horm Res 1995; 43: 29–38. Foster MP, Jensen ER, Montecino-Rodriguez E, Leathers H, Horseman N, Dorshkind K. Humoral and cell-mediated immunity in mice with genetic deficiencies of prolactin, growth hormone, insulin-like growth factor-I, and thyroid hormones. Clin Immunol 2000; 96: 140-9. Davis SL. Environmental modulation of the immune system via the endocrine system. Domest Anim Endocrinol 1998; 15: 283–9. Csaba G, Kovács P, Pállinger É. Immunologically demonstrable hormones and hormone-like molecules in rat white blood cells and mast cells. Cell Biol Internat 2004; 28: 487-90. Csaba G, Pállinger É. Thyrotropic hormone (TSH) regulation of triiodothyronine (T3) concentration in immune cells. Inflamm Res 2009; 58: 151-4. Silberstein S, Vogl AM, Bonfiglio JJ, Wurst W, Holsboer F, Arzt E, Deussing JM, Refojo D. Immunology, signal transduction, and behavior in hypothalamic-pituitary-adrenal axis-related genetic mouse models. Ann N Y Acad Sci 2009; 1153: 120-30. Chatterjee S, Chandel AS. Immunomodulatory role of thyroid hormones: in vivo effect of thyroid hormones on the blastogenic response to lymphoid tissue. Acta Endocrinol 1983; 103: 95-100. Ohashi H, Itoh M. Effects of thyroid hormones on lymphocyte phenotypes in rats: changes in lymphocyte subsets related to thyroid function. Endocr Regul, 1994; 28: 117–23. Watanabe W, Shimizu T, Hino A, Kurokawa M. A new assay system for evaluation of developmental immunotoxicity of chemical compounds using respiratory syncytial virus infection to offspring mice. Environ Toxicol Pharmacol 2008; 25: 69-74. Afhami S, Haghpanah V, Heshmat R, Rasoulinejad M, Izadi M, Lashkari A, Tavangar SM, Hajiabdolbaghi M, Mohraz M, Larijani B. Assessment of the factors involving in the development of hypothyroidism in HIV-infected patients: a case-control study. Infection 2007; 35: 334-8. Ho HC, Chapital AD, Yu M. Hypothyroidism and adrenal insufficiency in sepsis and hemorrhagic shock. Arch Surg 2004; 139: 1199-203. Golombek SG. Nonthyroidal illness syndrome and euthyroid sick syndrome in intensive care patients. Semin Perinatol 2008; 32: 413-8. Stagi S, Azzari C, Bindi G, Galluzzi F, Nanni S, Salti R, Vierucci A. Undetectable serum IgA and low IgM concentration in children with congenital hypothyroidism. Clin Immunol 2005; 116: 94-8. Keast D, Ayre DJ. Antibody regulation in birds by thyroid hormone. Dev Comp Immunol 1980; 4: 323–30. Klecha AJ, Genaro AM, Lysionek AE, Caro RA, Coluccia GA, Cremaschi GA. Experimental evidence pointing to the bidirectional interaction between the immune system and the thyroid axis. Int J Immunopharmacol 2000; 22: 491-500. Klecha AJ, Genaro AM, Gorelik G, Barreiro Arcos ML, Silberman MD, Schuman M, Garcia SI, Pirola C, Cremaschi GA. Integrative study of hypothalamus- pituitary-thyroid-immune system interaction: thyroid hormone mediated modulation of lymphocyte activity through the protein kinase C signaling pathway. J Endocrinol 2006; 189: 45-55. Schoenfeld PS, Myers JW, Myers L, LaRocque JC. Suppression of cell-mediated immunity in hypothyroidism. South Med J 1995; 88: 347-9. Bittencourt CS, Azzolini AECS, Ferreira DA, Assis-Pandochi AI. Antibody responses in hyperthyroid rats. Int Immunopharmacol 2007; 7: 989-93. Vinayagamoorthi R, Koner BC, Kavitha S, Nandakumar DN, Padma Priya P, Goswami K. Potentiation of humoral immune response and activation of NF-kappaB pathway in lymphocytes in experimentally induced hyperthyroid rats. Cell Immunol 2005; 238: 56-60. Nandakumar DN, Koner BC, Vinayagamoorthi R, Nanda N, Negi VS, Goswami K, Bobby Z, Hamide A. Activation of NF-κB in lymphocytes and increase in serum immunoglobulin in hyperthyroidism: Possible role of oxidative stress. Immunobiology 2008; 213: 409-15. Yao C, Zhang J, Wang L, Guo Y, Tian Z. Inhibitory effects of thyroxine on cytokine production by T cells in mice. Int Immunopharmacol 2007; 7: 1747-54. Kruger TE. Immunomodulation of peripheral lymphocytes by hormones of the hypothalamus-pituitary-thyroid axis. Adv Neuroimmunol 1996; 6: 387-95. Barreiro Arcos ML, Gorelik GJ, Klecha AJ, Genaro AM, Cremaschi GA. Thyroid hormones increase inducible nitric oxide synthase gene expression down-stream PKC ζ in tumor murine T lymphocytes. Am J Physiol Cell Physiol 2006; 291: C327-36. Mascanfroni I, Montesinos MM, Susperreguy S, Cervi L, Ilarregui JM, Ramseyer VD, Masini-Repiso AM, Targovnik HM, Rabinovich GA, Pellizas CG. Control of dendritic cell maturation and function by triiodothyronine. FASEB J 2008; 22: 1032-42. McEwen BS. Central effects of stress hormones in health and disease: understanding the protective and damaging effects of stress and stress mediators. Eur J Pharmacol 2008; 583: 174–85. Glaser R, Kiecolt-Glaser JK. Stress-induced immune dysfunction: Implications for health. Nat Rev Immunol 2005; 5: 243–51. Nunez MJ, Balboa J, Rodrigo E, Breñilla J, Gonzalez-Peteiro M, Freire-Garabal M. Effects of fluoxetine on cellular immune response in stressed mice. Neurosci Lett 2006; 396: 247–51. Silberman DM, Zorrilla-Zubilete M, Cremaschi GA, Genaro AM. Protein kinase C-dependent NF-kB activation is altered in T cells by chronic stress. Cell Mol Life Sci 2005; 62: 2-10. Silberman DM, Wald M, Genaro AM. Acute and chronic stress exert opposing effects on antibody responses associated with changes in stress hormone regulation of T-lymphocyte reactivity. J Neuroimmunol 2003; 144: 53–60. Merlot E, Moze E, Dantzer R, Neveu PJ. Cytokine production by spleen cells after social defeat in mice: Activation of T cells and reduced inhibition by glucocorticoids. Stress 2004; 7: 55–61. Elenkov IJ, Chrousos GP. Stress system organization, physiology and immunoregulation. Neuroimmunomodulation 2006;13: 257-67. Azpiroz A, Fano E, Garmendia L, Arregi A, Cacho R, et al. Effects of chronic mid stress (CMS) and imipramine administration on spleen mononuclear cell proliferative response, serum corticosterone level and brain norepinephrine content in male mice. Psychoneuroendocrinology 1999; 24: 345–61. Radosavljević VR, Janković SM, Marinković JM. Stressful life events in the pathogenesis of Graves” disease. Eur J Endocrinol 1996; 134: 699-701. Wang S, Mason J. Elevations of serum T3 levels and their association with symptoms in World War II veterans with combat-related posttraumatic stress disorder: replication of findings in Vietnam combat veterans. Psychosom Med 1999; 61: 131-8. Olff M, Güzelcan Y, de Vries GJ, Assies J, Gersons BP. HPA- and HPT-axis alterations in chronic posttraumatic stress disorder. Psychoneuroendocrinology 2006; 31: 1220-30. Chrousos GP, Gold PW. The concepts of stress and stress system disorders. Overview of physical and behavioral homeostasis. JAMA 1992; 267: 1244-52. Cremaschi GA, Gorelik G, Klecha A, Lysionek AE, Genaro AM. Chronic stress influences the immune system through the thyroid axis. Life Sci 2000; 67: 3171–9. Ray PP, Sengupta A, Chaudhuri-Sengupta S, Maiti BR. Thyroidal inhibition following diverse stress in soft-shelled turtle, Lissemys punctata punctata bonnoterre. Acta Biol Hung 2008; 59: 403-12. Stratakis CA, Chrousos GP. Neuroendocrinology and pathophysiology of the stress system. Ann NY Acad Sci 1995; 771: 1–18. Lo MJ, Kau MM, Chen YH, Tsai SC, Chiao YC, Chen JJ, Liaw C, Lu CC, Lee BP, Chen SC, Fang VS, Ho LT, Wang PS. Acute effects of thyroid hormones on the production of adrenal cAMP and corticosterone in male rats. Am J Physiol 1998; 274: E238–45. Johnson EO, Kamilaris TC, Calogero AE, Gold PW, Chrousos GP. Experimentally-induced hyperthyroidism is associated with activation of the rat hypothalamic-pituitary-adrenal axis. Eur J Endocrinol 2005; 153: 177-85. Reichardt HM. Immunomodulatory activities of glucocorticoids: insights from transgenesis and gene targeting. Curr Pharm Des 2004; 10: 2797-805. Thaker PH, Sood AK. Neuroendocrine influences on cancer biology. Semin Cancer Biol 2008; 18: 164-70. Thaker PH, Han LY, Kamat AA, Arevalo JM, Takahashi R, Lu C, Jennings NB, Armaiz-Pena G, Bankson JA, Ravoori M, Merritt WM, Lin YG, Mangala LS, Kim TJ, Coleman RL, Landen CN, Li Y, Felix E, Sanguino AM, Newman RA, Lloyd M, Gershenson DM, Kundra V, Lopez-Berestein G, Lutgendorf SK, Cole SW, Sood AK. Chronic stress promotes tumor growth and angiogenesis in a mouse model of ovarian carcinoma. Nat Med 2006; 12: 939-44. Sá-Rocha VM, Sá-Rocha LC, Palermo-Neto J. Variations in behavior, innate immunity and host resistance to B16F10 melanoma growth in mice that present social stable hierarchical ranks. Physiol Behav 2006; 88: 108-15. Morgulis MS, Stankevicius D, Sá-Rocha LC, Palermo-Neto J. Cohabitation with a sick cage mate: consequences on behavior and on ehrlich tumor growth. Neuroimmunomodulation 2004; 11: 49-57. Freire-Garabal M, Rey-Méndez M, García-Vallejo LA, Balboa J, Suárez JM, Rodrigo E, Brenlla J, Núñez MJ. Effects of nefazodone on the development of experimentally induced tumors in stressed rodents. Psychopharmacology 2004; 176: 233–8. Frick LR, Arcos ML, Rapanelli M, Zappia MP, Brocco M, Mongini C, Genaro AM, Cremaschi GA. Chronic restraint stress impairs T-cell immunity and promotes tumor progression in mice. Stress 2009; 12: 134-43. Calcagni E, Elenkov I. Stress system activity, innate and T helper cytokines, and susceptibility to immune-related diseases. Ann N Y Acad Sci 2006; 1069: 62–76. Christianson SW, Greiner DL, Schweitzer IB, Gott B, Beamer GL, Schweitzer PA, Hesselton RM, Shultz LD. Role of natural killer cells on engraftment of human lymphoid cells and on metastasis of human T-lymphoblastoid leukemia cells in C57BL/6J-scid mice and in C57BL/6J-scid bg mice. Cell Immunol 1996; 171: 186–99. Turner WJ, Chatten J, Lampson LA. Human neuroblastoma cell growth in xenogeneic hosts: Comparison of T cell-deficient and NK-deficient hosts, and subcutaneous or intravenous injection routes. J Neurooncol 1990; 8: 121–32. Frick LR, Rapanelli M, Bussmann UA, Klecha AJ, Arcos ML, Genaro AM, Cremaschi GA. Involvement of thyroid hormones in the alterations of T-cell immunity and tumor progression induced by chronic stress. Biol Psychiatry 2009; 65: 935-42. Helmreich DL, Parfitt DB, Lu XY, Akil H, Watson SJ. Relation between the hypothalamic-pituitary-thyroid (HPT) axis and the hypothalamic-pituitary-adrenal (HPA) axis during repeated stress. Neuroendocrinology 2005; 81: 183-92. Mastorakos G, Pavlatou M. Exercise as a stress model and the interplay between the hypothalamus-pituitary-adrenal and the hypothalamus-pituitary-thyroid axes. Horm Metab Res 2005; 37: 577-84. Yan L, Herrmann V, Hofer JK, Insel PA. β-adrenergic receptor/cAMP-mediated signaling and apoptosis of S49 lymphoma cells. Am J Physiol Cell Physiol 2000; 279: C1665–74. Laane E, Panaretakis T, Pokrovskaja K, Buentke E, Corcoran M, Söderhäll S, Heyman M, Mazur J, Zhivotovsky B, Porwit A, Grandér D. Dexamethasone-induced apoptosis in acute lymphoblastic leukemia involves differential regulation of Bcl-2 family members. Haematologica 2007; 92: 1460–9. Wang, H.C.; Klein, J.R. Immune function of thyroid stimulating hormone and receptor. Crit Rev Immunol 2001; 21: 323-37. Caturegli P, Kimura H, Rocchi R, Rose NR: Autoimmune thyroid diseases. Curr Opin Rheumatol 2007; 19: 44–8. Weetman AP. Cellular immune responses in autoimmune thyroid disease. Clin Endocrinol (Oxf) 2004; 61: 405–13. Phenekos C, Vryonidou A, Gritzapis AD, Baxevanis CN, Goula M, Papamichail M: Th1 and Th2 serum cytokine profiles characterize patients with Hashimoto”s thyroiditis (Th1) and Graves” disease (Th2). Neuroimmunomodulation 2004; 11: 209-13. Nakano A, Watanabe M, Iida T, Kuroda S, Matsuzuka F, Miyauchi A, Iwatani Y. Apoptosis-induced decrease of intrathyroidal CD4(+)CD25(+) regulatory T cells in autoimmune thyroid diseases. Thyroid 2007; 17: 25-31. Morris GP, Brown NK, Kong YC. Naturally-existing CD4(+)CD25(+)Foxp3(+) regulatory T cells are required for tolerance to experimental autoimmune thyroiditis induced by either exogenous or endogenous autoantigen. J Autoimmun 2009; 33: 68-76. McLachlan SM, Nagayama Y, Pichurin PN, Mizutori Y, Chen CR, Misharin A, Aliesky HA, Rapoport B. 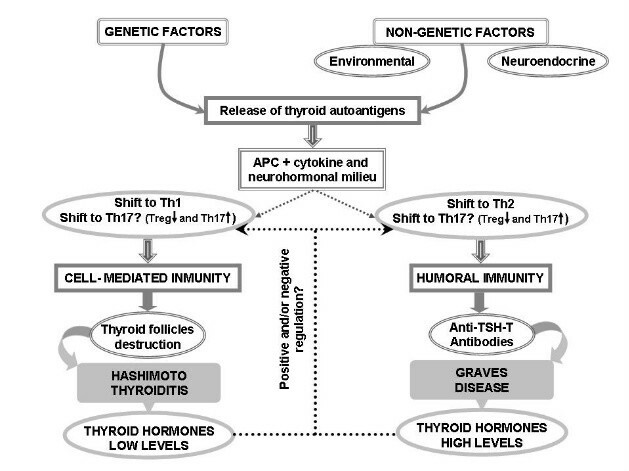 The link between Graves” disease and Hashimoto”s thyroiditis: a role for regulatory T cells. Endocrinology 2007; 148: 5724-33. Figueroa-Vega N, Alfonso-Pérez M, Benedicto I, Sánchez-Madrid F, González-Amaro R, Marazuela M. Increased Circulating Pro-Inflammatory Cytokines and Th17 Lymphocytes in Hashimoto”s Thyroiditis. J Clin Endocrinol Metab 2009, in press. Nanba T, Watanabe M, Inoue N, Iwatani Y. Increases of the Th1/Th2 cell ratio in severe Hashimoto”s disease and in the proportion of Th17 cells in intractable Graves” disease. Thyroid 2009; 19: 495-501. Tomer Y, Ban Y, Concepcion E, Barbesino G, Villanueva R, Greenberg DA, Davies TF: Common and unique susceptibility loci in Graves and Hashimoto diseases: results of whole-genome screening in a data set of 102 multiplex families. Am J Hum Genet 2003; 73: 736-47. Jacobson EM, Tomer Y: The CD40, CTLA-4, thyroglobulin, TSH receptor, and PTPN22 gene quintet and its contribution to thyroid autoimmunity: Back to the future. J Autoimmun 2007; 28: 85-98. Prummel MF, Strieder T, Wiersinga WM: The environment and autoimmune thyroid diseases. Eur J Endocrinol 2004; 150: 605–18. Ciampolillo A, Guastamacchia E, Amati L, Magrone T, Munno I, Jirillo E, Triggiani V, Fallacara R, Tafaro E: Modifications of the immune responsiveness in patients with autoimmune thyroiditis: evidence for a systemic immune alteration. Curr Pharm Des 2003; 9:1946-50. Gessl A, Wilfing A, Agis H, Steiner G, Czernin S, Boltz-Nitulescu G, Vierhapper H, Waldhäusl W.: Activated naive CD4+ peripheral blood T cells in autoimmune thyroid disease. Thyroid 1995; 5:117-25. Hodkinson CF, Simpson EEA, Beattie JH, O’Connor JM, Campbell DJ, Strain JJ, Wallace JM. Preliminary evidence of immune function modulation by thyroid hormones in healthy men and women aged 55–70 years. J Endocrinol 2009; 202: 55-63. El-Shaikh, K.A. ; Gabry, M.S. ; Othman, G.A. Recovery of age-dependent immunological deterioration in old mice by thyroxine treatment. J Anim Physiol Anim Nutr (Berl) 2006; 90: 244-54. Source: Cover Image: Overview of the thyroid system. Author: Mikael Häggström. Credit: Wikimedia Commons.